Kolkata 23 February 2019: Former Cricketer Captain of India, Sourav Ganguly, has been named as Ambassador of the Indian Team at the Street Child Cricket World Cup, finals of which will be held at Lord's. Sourav is currently President of the Cricket Association of West Bengal and President of the Editorial Board with Wisden India. The Street Child Cricket World Cup 2019 (SCCWC), being held in May 2019, ahead of the ICC Cricket World Cup, is the first Cricket World Cup for street-connected children. India is set to send two teams put together by Save the Children, The HOPE Foundation, Magic Bus and Karunalaya. Speaking at the Press Conference, Sourav Ganguly said, “It’s my honour to be an ambassador for the Street Child Cricket World Cup in India. I know from my own experience that sports has the power to inspire and bring out our country's untapped potential. This initiative will help provide a level playing field for children who have for too long been outside the boundary. I endorse the spirit of the initiative and stand with team India as they get ready to play at the prestigious Lord’s Cricket Ground”. Welcoming him on board, Chittapriyo Sadhu, State Program Manager, West Bengal & Assam for Save Children said,“It is a matter of great pride for all of us to prepare the Indian Team and Sourav Ganguly’s support and presence will add significant value and encouragement to the team and he will strengthen the team spirit through his focus, passion and commitment to the game”. 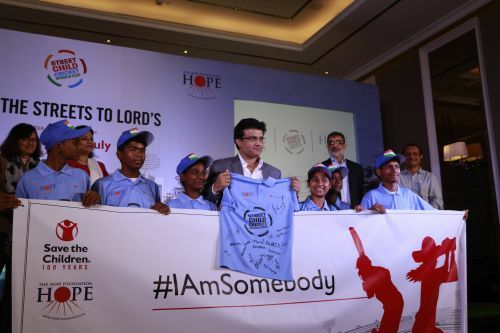 Geeta Venkadakrishnan, Director, Hope Kolkata Foundation added, “We are delighted to have a cricket legend like Sourav Ganguly lend his support to children who got this fantastic opportunity to play the game at an international platform. With such opportunities being given to children living in street situation, there’s hope that they will also be mainstreamed and not ignored”. The tournament is being organised by Street Child United (SCU), a UK based organization, which has a legacy of holding street child tournaments around major sporting festivals like FIFA World Cup in South Africa, Olympics in Brazil, FIFA World Cup Russia and more. The SCCWC will give an opportunity to street connected children from nine countries to play at the prestigious Lord’s Cricket Ground. The tournament aims to unite people from various nations and spotlight the life of #TheInvisibles (street connected children). Off the pitch, the young people will make their voices heard and make recommendations to help improve the lives of street children worldwide. There are 20 lakh children living on the streets of India. These children are alone, unprotected and invisible. Show your support to make #TheInvisibles Visible. Please visit our website www.savethechildren.in and www.hopechild.org to donate online.